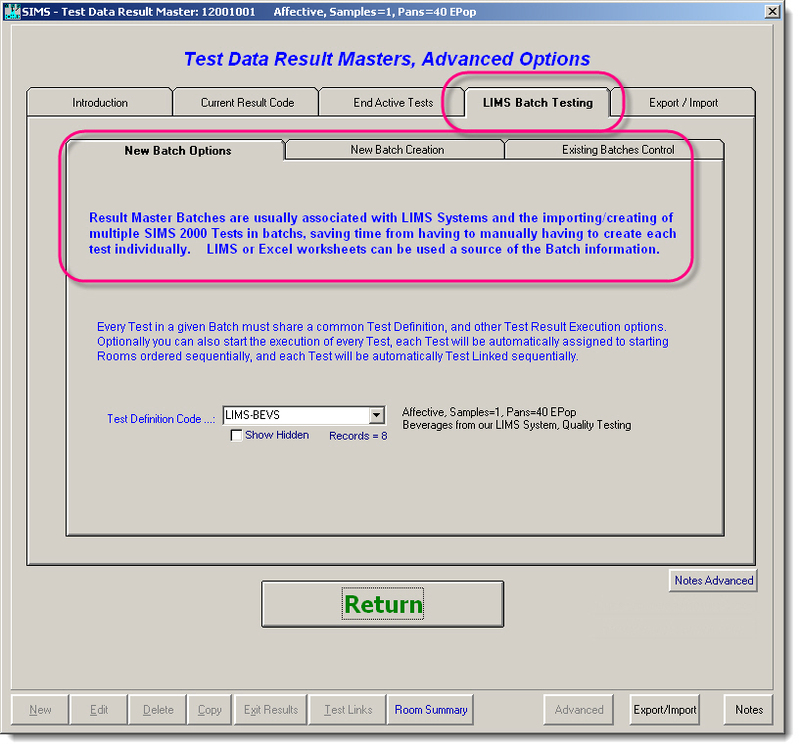 SIMS <--> LIMS Batch Testing Examples, automated SIMS LIMS communications back-n-forth. of multiple SIMS Tests in batches, saving you time from having to manually having to create each test individually. Your LIMS database or Excel worksheets can be used a source of the Batch information. 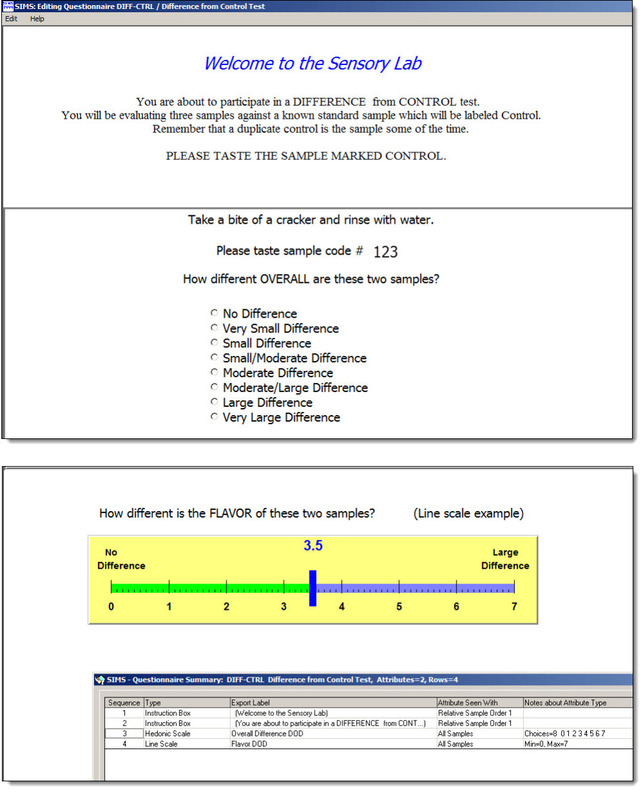 a one sample SIMS Test, Experiment vs Contol. Measure the degree of difference. See examples of DOD ballots. In addition to DODs all other questions types are supported for your batch usage including comments. then automatically Starts these Tests in sequential SIMS affective test rooms! Ready-to-test immediately! New Batch Creation, this example shows 20 Tests in a batch. then automatically Starts these Tests in sequential SIMS affective test rooms! Ready-to-test immediately. Every Test in a given new Batch must share a common SIMS Test Definition, and other SIMS Test Result Execution options. to starting rooms ordered sequentially, and each Test will be automatically Test Linked sequentially. since this will be the Test Definition used for every Result Code in the New Batch Creation. Helpful information about the current SIMS Test Definition is shown in few places on screen. You'll need to enter in a valid LIMS Batch_Number. See your LIMS Administrators. Batch_Number can be up to 20 alphanumeric characters in length and usually not case sensitive. Or use [Excel Import] to populate the new batch. 4 columns. Or use [Examples] button to populate batch with 20 example tests in an example batch. Verifies all of fields, rows, and columns of the loaded Batch. Repeats above verify, then performs additional verifications for Test Definitions and Testing Rooms. 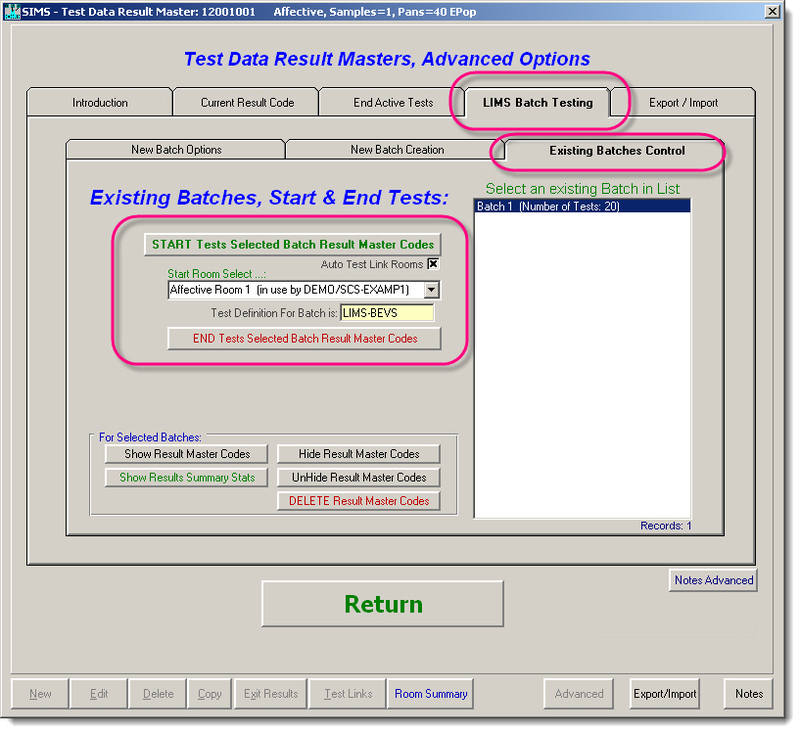 Creates new SIMS Tests for each record/row of the loaded Batch, Result Code Masters. 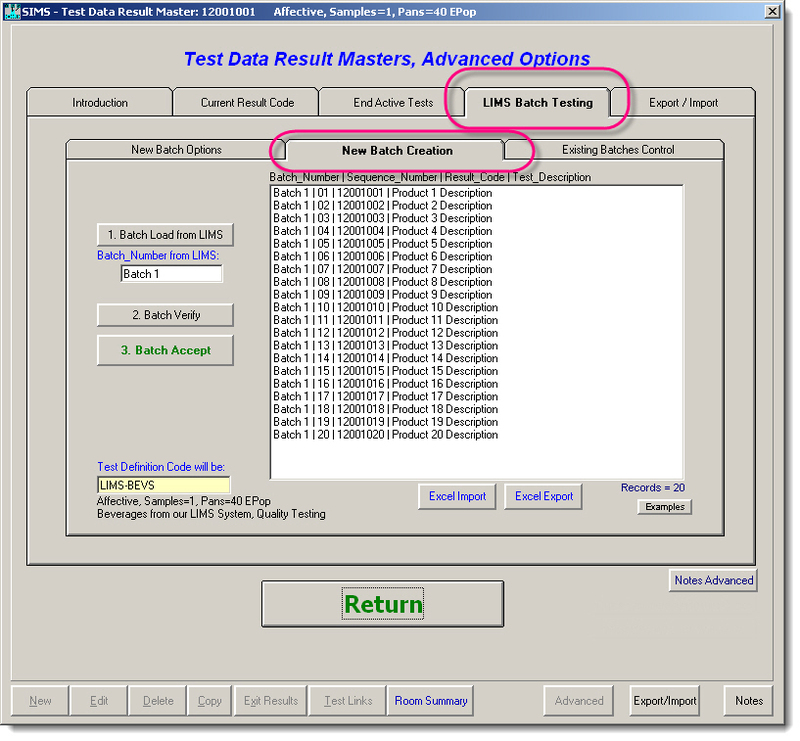 Button 1 - START Tests Selected Batch Result Master Codes. Automatically starts all the batch Tests in sequential SIMS Testing Rooms. You'll need to enter in a valid Starting Room. Unused and Continuous Testing Rooms must be available in the SIMS System. or End some Tests, or Add New Rooms to the SIMS System. 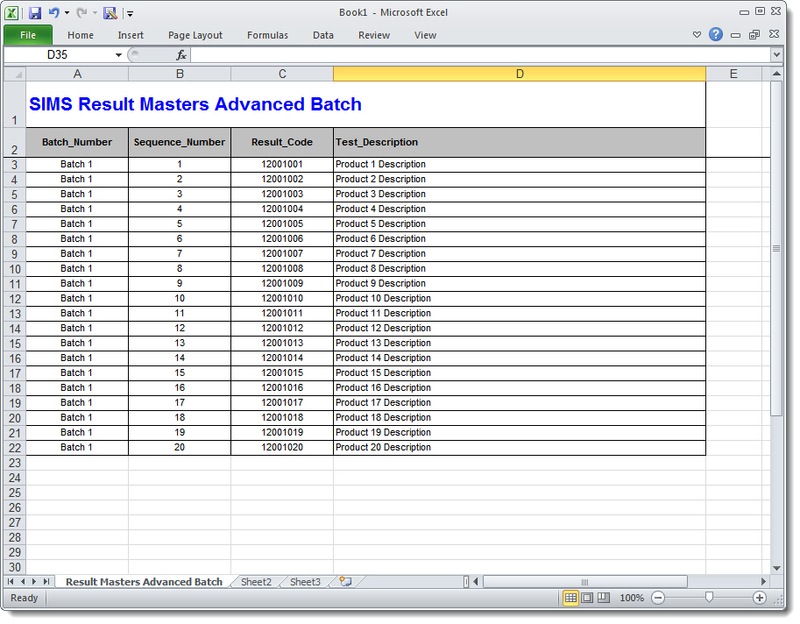 Button 2 - END Tests Selected Batch Result Master Codes. Ends every test that exists in the Batch. Button 3 - Show Result Master Codes. Nice quick-n-easy look at any existing Batches in the SIMS System. # Data Records, Active Status, and Hidden Status. Button 4 - Hide  Result Master Codes. To toggle the status for visual inclusion on the Result Masters screen main grid. Button 5 - UnHide Result Master Codes. Button 6 - DELETE Result Master Codes. Danger, please preceed with caution, multiple tests & data loss. data record, then standard warning screens will be shown to the user. 10 Data records is low enough to assume that the Batch was never used. Greater Data Record counts will require a special Access Restrictd Passwords. IF IN DOUBT, DO NOT DELETE YOUR TEST DATA. The following is an example of how to create a 'simulated' LIMS_BATCH View result set. Normally your View would be written to access your LIMS System Database. The View named LIMS_BATCH exists is the SIMS database, points to your LIMS System, and is authored/created by your LIMS DBA Administrator. DOD Questionnaire Example Line Scale More examples here.